Making Room: Our Life in Sicily: have you heard of Songza? One bummer of living overseas is you can't use any of the major streaming services, like Hulu and Spotify and Pandora and Netflix Streaming (yes, Netflix, even though you pay for a subscription and everything!). Trust me, I've tried. Over and over. It's because we have an Italian IP (internet) address and these services are not yet authorized to play in certain countries. I guess one plus is that it does cut down on the amount of TV Elliott and I might possibly would definitely watch. But it's just sad that we can't stream free music in this day and age. How else is a new mama living on an island (hah) supposed to stay relevant, hip, and cool? So when I come back to the States I indulge myself in streaming music services (and Starbucks and B&N and thrift stores and Chipotle). 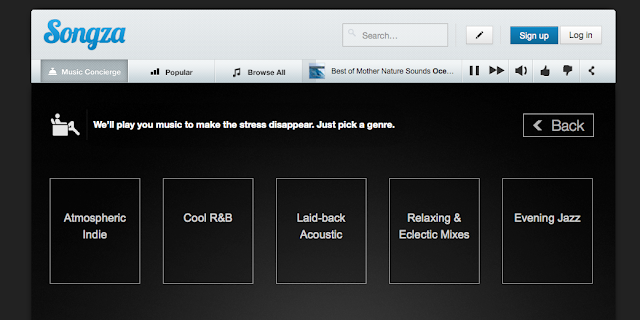 My favorite streaming music site is Songza, a totally hip site that helps narrow down my radio station to my mood. I took some screenshots to introduce you to it. Because I wanted to prove to you how hip and cool I am (despite my earlier self-pitying proclamations otherwise), I chose "Atmospheric Indie." Because I was a little frightened when I got to this page and realized I was in over my head, I chose "Dream Pop." I like nice dreams. And here I am, with you, looking at this page and enjoying some mellow, chill tunes. Ahhh...! Three words: No. Audio. Ads. Move over, Pandora. A "Popular" tab where you can play popular playlists from this week, this year, or that are currently trending. For those of us who are really concerned about staying relevant. The same rating system as we're all used to from other music streaming services: skip this song, thumbs up (play more like this), thumbs down, pause. 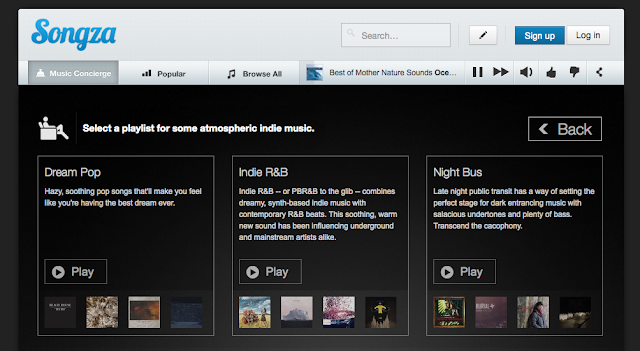 Search and "browse all songs" features to find what you're really looking for. Apps for your iPhone, Android, and Kindle, too. Now go check out Songza and enjoy along with me! P.S. Songza obviously did not pay me to write this. I am not that cool. 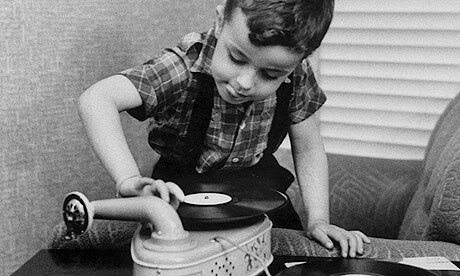 Vintage vinyl image via here. Nifty! I'll tell my daughter about that, as her old crotchety parents (ahem...) pretty much listen to NPR these days. But you totally reminded me---I did NOT miss regular commercials when we lived in Germany. Since we only watched AFN channels, we were really out of the loop for "stuff" commercials. A bunch of college kids came to our church to lead a VBS one summer, and they kept laughing at "It's a Hemi." No one, seriously NO ONE at our church knew what they were talking about. Ah, your posts make me miss those days! It is so great how you can tailor what you listen to by your mood. Perfect! There's a way to get over the IP address issue. Casey changed our IP address to make it seem like we were in England so we could watch the Olympics on the BBC. If you're interested I could ask him how he did it. It's not technically legal so we've chosen not to do it. LOTS of our friends in Italy do this, though. This is really interesting--- I'd never even heard of it! Definitely checking this out. Just found your blog in the comments section of Making It Lovely. Love reading your adventures around Sicily! I grew up between Nicolosi a Mascalucia. (My father was in the Navy) Miss seeing Mt. Etna and the town markets. Although it's so far from Virginia I hope it's been a wonderful, enriching experience so far! The hiking Mt. Etna erupting pictures are awesome. i am with you on the frustrations of living over seas! also, you could check out projectfreetv.com - it's like hulu! I don't know exactly what genre of music you like best, but have you tried streaming music from KLOVE.com? It's a contemporary Christian radio station. They also stream on the Internet. I don't know if Italy filters them out, but it might be worth a try if you enjoy it. Stacie and Krystal, thanks for the recommendations. I'll be sure to check them out. Thanks for the info about Songza. 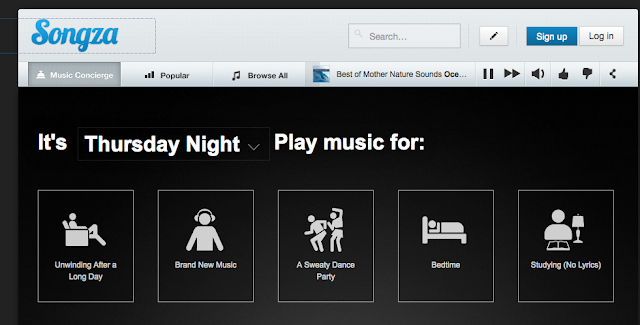 Another option over here is Jango.com because it looks like Songza has gone the route of Pandora and won't allow overseas use.